Recently planted trees in Copley Square replaced a grove consumed by a lethal fungus, but now sport dead leaves. Urban trees are subject to pollution, road salt, and acidic soil. Many of the stately trees that frame Copley Square once again look to be near death, their leaves dry, brown, and crinkly less than a month after they replaced a previous grove of London planes that had been consumed by a lethal fungus. 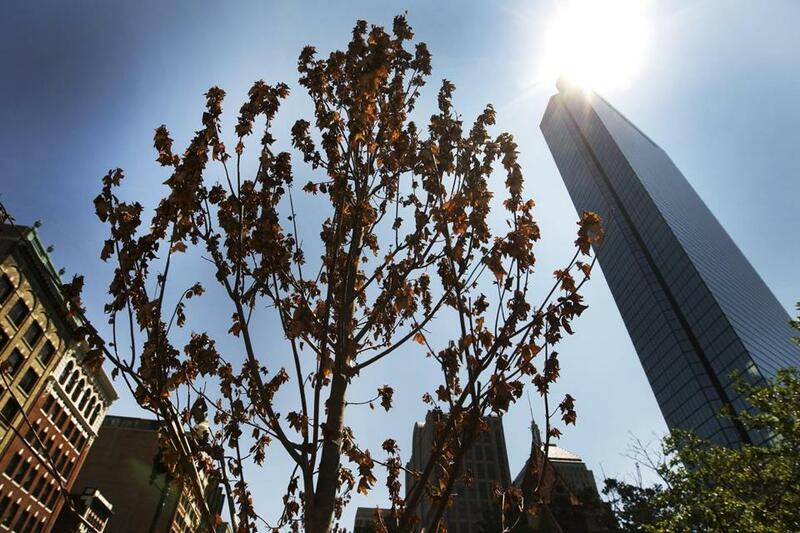 If they have to be uprooted again, it would be the third time in about a decade, reflecting the challenges Boston faces as it tries to expand its urban tree cover. Five years ago, city officials set a goal of planting 100,000 trees by the end of this decade, but they have fallen behind and are struggling just to keep pace with the high mortality rate of trees that have fallen victim to heavy storms, disease, and the regular urban onslaught of pollution, road salt, acidic soil, and reckless driving, among other perils. A study this year by ­researchers at the US Forest Service found that Boston experienced a net loss of nearly 1 percent of its roughly 1.2 million trees between 2003 and 2008. Some 4 million trees a year are disappearing from ­urban areas across the United States, they estimate. At the same time, the amount of roads, sidewalks, and other impermeable surfaces in the city increased by nearly 2 percent, reducing the space available to plant trees, according to the study published in February in the journal Urban Forestry & Urban Greening. The researchers estimated that Boston has roughly 28 percent of its land area covered by trees, significantly less than other urban areas in the state and the nation. 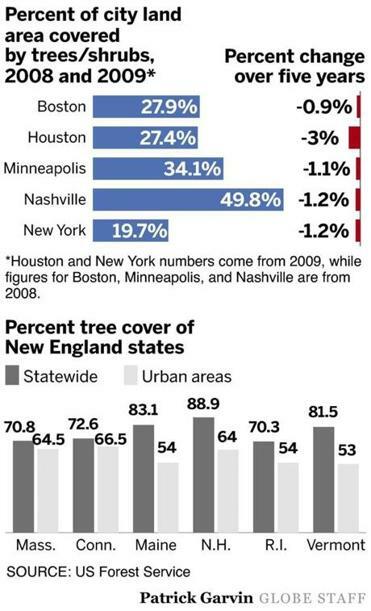 On average, ­urban areas in Massachusetts have about 65 percent of their land covered by trees, they said; nationally, the figure is 35 percent. The campaign to expand Boston’s tree canopy has languished since it began in 2007, as the recession brought deep cuts to budgets for trees and parks. Donations by companies and foundations fizzled, and homeowners and volunteers have had more pressing ­demands for their money and time. City officials have since planted an average of about 500 trees a year, at a cost of between $600 and $900 for each tree, which includes the cost of removing dead trees or stumps. They hope to expand the city’s tree canopy to cover 35 percent of the city by 2020. Businesses, homeowners, and nonprofit organizations have planted thousands of ­additional trees, but officials had expected that many more would have been growing by now in large development projects stalled by the slow economy, such as Harvard University’s expansion into Allston and the transformation of the ­Seaport District and Herald Square into more residential neighborhoods. The city has also had to replace an unusually large number of trees in recent years that have suffered as a result of the heavy snows the winter before last, and the freak Halloween-eve snowstorm last fall. Micro­burst windstorms have felled century-old trees on the ­Esplanade and diseases have required removal of historic elms and maples on Boston Common and in the Public ­Garden. Indeed, the city last fiscal year spent $700,000 to plant 1,100 trees on the streets, and officials expect to spend the same this fiscal year. They are also seeing new grants for the program from companies and other organizations. Valerie Burns, president of the Boston Natural Areas Network, which promotes urban open spaces, said the city is now better organized about the initiative and expects to meet its goals. She said her organization alone in the past year has raised more than $100,000, which she said is enough to plant about 350 trees. As a coordinator of the ­Boston Urban Forest Council, which is pushing the tree initiative, she plans to encourage the city’s large property owners, such as universities, to plant more trees. “Now that the economy has improved, we’re discovering a much deeper interest to help and to get people involved,” Burns said. But planting trees is just the first step. The larger expense is helping them thrive in the first few years, maintaining them as they grow, warding off disease, and finding enough space for their roots. In Back Bay, the Friends of the Public Garden, a private group that looks after about 1,800 trees from the Common to the Commonwealth Avenue Mall, has spent about $100,000 a year just to fight Dutch Elm disease, which has ravaged some of the most graceful of the city’s giants and threatens to infect others nearby. The group has also been testing new ways to aerate the soil where trees grow. One of the largest problems for city trees is that their soil is constantly compacted by thousands of pedestrians, which ­reduces the ability of roots to absorb oxygen and water and makes it harder to survive. “If we didn’t do what we’ve been doing, we wouldn’t have any elm trees in the area,” said Elizabeth Vizza, executive ­director of the Friends. As for the copse of London planes on Copley Square, city officials are holding out hope that, with enough water and patience, they may rebound. The saplings apparently ­experienced a shock from the recent heat waves and will be replaced at the contractor’s ­expense if they don’t survive, the officials said.